Reality Clash is an exciting and innovative augmented reality FPS combat game available on iOS and Android, which is also free to play! Set in an underground world of cryptocurrency and hackers, the game combines geo-location gaming and multiplayer first-person shooter battles to provide a unique player experience. Players step through an augmented reality portal and enter a virtual battlefield in which they can challenge their friends to real-time combat. Win resources and glory for your team or make a name for yourself in this new genre of gaming. We recommend downloading and starting the game whilst connected to a Wifi network to ensure a stable download. Will my mobile device support the game? Due to the demand placed on devices by augmented reality apps, only models which support ARKit or ARCore are able to play the game. Why isn’t the game available in my region? You can click here to find out which regions the game is currently live in. 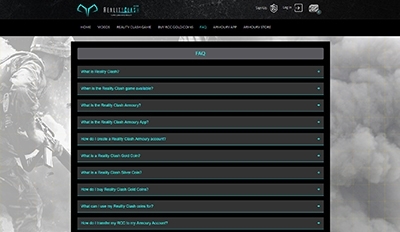 Do not worry if your region is not listed, Reality Clash will be made available in more areas throughout 2019. I downloaded the game, what do I do now? A short tutorial will guide you through the main features of the game and train you for your first battle in the virtual world. After completing the tutorial, head out to the marked locations on your map and explore opportunities to gain xp and resources. Successfully defeat enemies whilst standing within a Node area to gain control of it and unlock the ability to collect resources from the location. Any member of your team will be able to visit the location and collect resources. These resources can be used to build better weaponry. I want to build more weapons; how do I do this? To build weapons, you need Resources, Silver and Blueprints. These can be gathered from Node locations, purchased in-app or earned through combat with players and bots. Navigate to the in-game Armoury to unlock and build these new weapons when you gather enough materials. You can also customize your weapons in the Armoury and add accessories such as sights, suppressors, grips and stocks. What is Reality Clash Silver? Reality Clash Silver is the in-app currency. It can be purchased from the Store or earned within the mobile game. Silver can be used to build in-game items or speed up activities. There are 3 types of Resource in the Reality Clash game. These are Blocks, Contracts and Keys. Resources are used to build powerful new weaponry for you to use against your enemies. Resources are collected by taking control of a Node and placing a Mine at that location. A Node is a clearly defined area on the map where players can fight for control and if successful – players can place a Mine at the Node in order to harvest the available Resource. The type of Resource available at a Node is indicated by the image above the Node. If you take over a Node, anyone in your team can place a Mine there. But beware – enemy teams can attack and take over your Node – destroying your Node. Be prepared to fight back or defend your Node! A SafeZone is a location marked on the map which players can visit in order to slowly regain health and avoid challenges from other players. SafeZones also offer a chance for players to pick up more health packs. In the future, these SafeZones will appear at popular retail destinations and will also offer discounts/incentives for players to visit them. Can I challenge my friends? Challenge your friends in an open space for an exciting 1v1 virtual combat experience. Use digitally rendered cover to hide from your opponent or charge forward and challenge them head-on. What are the available teams? There are 3 teams battling for control of the virtual world known as 'The Sim'. You will automatically be assigned to a team but will have the opportunity to switch to another team in the future. Can I make a clan or squad with friends? This is a feature which will be introduced later in 2019. Does the game use my GPS? Yes, the game is a geo-location based game which requires an active GPS connection to enable play. Combat also requires an active connection to transmit movement and other data.